The Village of Mt. Zion recognizes the importance of recycling but at the same time understands that not everyone wants to recycle. Therefore, recycling is optional in the Village of Mt. Zion and has been added as a service to Mt. Zion residents at no additional cost. Mt. 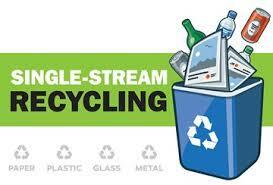 Zion's curbside recycling program is a single stream program. What does that mean? It means that recyclable materials do NOT need to be sorted. Simply place the recyclable material in the provided bin and leave it by the curb on your designated pick-up day. It's that easy and the Village of Mt. Zion encourages all residents to participate in the recycling program. Effective January 1, 2018 all residential haulers of garbage for the Village of Mt. Zion are required to provide a recycling bin/toter to each residence upon request at no cost to the resident. The large bin/toters must have a lid to help prevent spillage and blowing of debris. Each licensed hauler within the Village of Mt. Zion is required to provide the following services for a maximum of $22.75 per month charge. 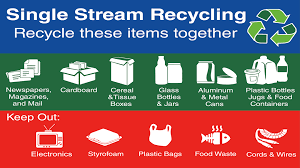 For a list of acceptable recyclable items, CLICK HERE. How do I get a recycle bin/toter? To have a reycling bin/toter delivered to your residence, contact your garbage hauler and request a recycle bin/toter. Each hauler is required per Village Ordinance to provide one recycling bin/toter to each residence upon request at no additional charge. What services do I get for my $22.75 monthly garbage bill?